Hungarian city, capital of the district of the same name. Its Jewish community, according to a document of 1526, dates from the tenth century and is one of the oldest in Hungary. The town was destroyed by fire in 1317. Charles Robert invited Jewish colonists into the town in 1324; they lived there in peace until 1354, when they were expelled by Louis the Great. Most of them went to Austria and settled in Wiener-Neustadt. A few years afterward they were allowed to return, and in 1379 the Jewish population in Oedenburg amounted to 80, reaching 400 toward the end of the fifteenth century. Recognizing that the Jews constituted a valuable fiscal asset, Frederick III., to whom Elizabeth had mortgaged Oedenburg, took energetic measures to protect the Jews there against the aggression of their Christian fellow citizens and prevent their expulsion (1441). In 1490 the citizens of Oedenburg seized upon the Jews and cast them into prison with the declared intention of keeping them there until they consented to cancel the obligations of their Christian debtors; John Corvinus and Beatrix, however, took them under their protection. Beginning with the sixteenth century the lot of the Jews in Oedenburg grew constantly worse, and they were often assailed by the people in spite of the "protection" of the feeble King Louis II. In 1526, after the battle of Mohacs, they were expelled, their houses were broken into and plundered, and the so-called "Jews' account-book," in which the legally certified debts of the Christians were entered, was destroyed. Even the cemetery and the synagogue were wrecked. Some of the volumes now in the municipal archives of Oedenburg are covered with parchment that once constituted parts of books destroyed on this occasion. All these raids occurred with the consent of the mayor and the city council. The expelled Jews fled principally to Eisenstadt, Mattersdorf, and Kobersdorf, where they instituted suits for damages against the city of Oedenburg. The litigation lasted for eight years and was decided partially in their favor, though their demand to be readmitted was rejected, Ferdinand I., on Sept. 12, 1534, authorizing Oedenburg to refuse to readmit them. They were, however, allowed to visit the fairs and to peddle in the city. In 1615 peddling also was forbidden. Some time afterward it happened that they gained the favor of Prince Paul Esterhazy, who was at this time prefect of the county of Oedenburg; he brought his influence to bear upon the city council in behalf of the Jews, with the result that in 1665 they were permitted to enter the city on Tuesdays and Wednesdays on presentation of a ticket, for which they had to pay eight pfennig; but only one Jew was allowed to enter the city at a time. In 1740, at the instance of Counts Esterhazy, Battyányi, and Draskovits, the city granted permission to all Jews of the counties of Oedenburg and Eisenstadt to enter the city. By 1766 they were allowed to remain in the town from Monday to Friday continuously, and carry on business. The city of its own accord granted them permission to secure a separate lodging-house and a cook-shop; but for this privilege they paid at first 270 gulden, and later 1,071 gulden (1804). They were not permitted, however, to set up permanent households. Even as late as 1813 it was the law that whoever rented a dwelling-house or a storeroom to a Jew for an extended term would be fined 100 gulden; a second offense of the same nature entailed loss of the privileges of citizenship. But in spite of such severe measures the citizens continued to rent houses to Jews; in 1818 the latter even possessed a place of prayer. 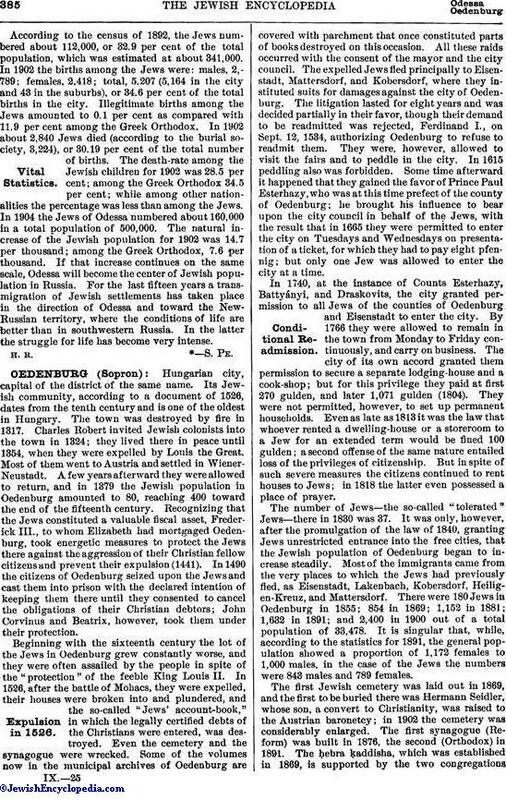 The number of Jews—the so-called "tolerated" Jews—there in 1830 was 37. It was only, however, after the promulgation of the law of 1840, granting Jews unrestricted entrance into the free cities, that the Jewish population of Oedenburg began to increase steadily. Most of the immigrants came from the very places to which the Jews had previously fled, as Eisenstadt, Lakenbach, Kobersdorf, Heiligen-Kreuz, and Mattersdorf. There were 180 Jews in Oedenburg in 1855; 854 in 1869; 1,152 in 1881; 1,632 in 1891; and 2,400 in 1900 out of a total population of 33,478. It is singular that, while, according to the statistics for 1891, the general population showed a proportion of 1,172 females to 1,000 males, in the case of the Jews the numbers were 843 males and 780 females. The first Jewish cemetery was laid out in 1869, and the first to be buried there was Hermann Seidler, whose son, a convert to Christianity, was raised to the Austrian baronetcy; in 1902 the cemetery was considerably enlarged. The first synagogue (Reform) was built in 1876, the second (Orthodox) in 1891. 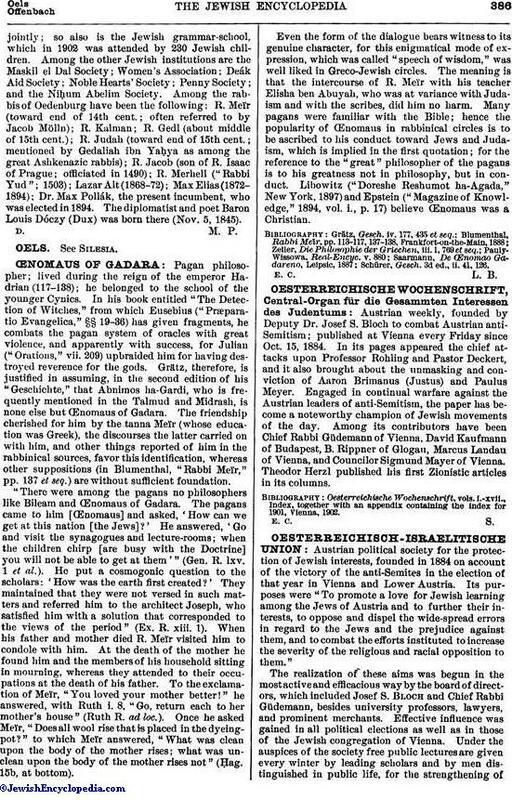 The ḥebra ḳaddisha, which was established in 1869, is supported by the two congregationsjointly; so also is the Jewish grammar-school, which in 1902 was attended by 230 Jewish children. Among the other Jewish institutions are the Maskil el Dal Society; Women's Association; Deák Aid Society; Noble Hearts Society; Penny Society; and the Niḥum Abelim Society. Among the rabbis of Oedenburg have been the following: R. Meïr (toward end of 14th cent. ; often referred to by Jacob Mölln); R. Kalman; R. Gedl (about middle of 15th cent. ); R. Judah (toward end of 15th cent. ; mentioned by Gedaliah ibn Yaḥya as among the great Ashkenazic rabbis); R. Jacob (son of R. Isaac of Prague; officiated in 1490); R. Merhell ("Rabbi Yud" 1503); Lazar Alt (1868-72); Max Elias (1872-1894); Dr. Max Pollák, the present incumbent, who was elected in 1894. The diplomatist and poet Baron Louis Dóezy (Dux) was born there (Nov. 5, 1845).